Airtel started the weekend plan, MTN followed suit and now Glo have decided to join the train. Glo has just recently introduced it's weekend plan which gives you a total of 3gb at just N500. Though i think its a bit expensive at that rate when compared to the other networks, but generally i think its a welcome development. Another good thing about this plan is that it's not only limited to the weekend alone as you can still use it during weekdays starting from 12am to 7am. With the year rounding up with introduction of new and affordable data plans like this, i really believe 2016 has a lot in stock for us. ==> Make sure you have at least N500 on your glo sim. ==> Dial *777*1*1*7# for the weekend plan. And for those who prefer the Night plan of 1gb at N200, you can Subscribe by dialing *777*1*1*1#. 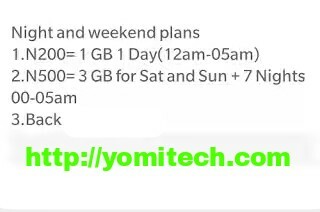 This plan works on all internet enabled device and its valid for 7days.